It’s not always deliberate that a great piece of work is left unfinished – see Schubert’s 8th Symphony or Mozart’s Requiem, for example. However, sometimes in the creative process there’s a realisation of the beauty in raw or ‘unfinished’ materials. And in the case of homes and other buildings, there’s an aesthetic choice about whether or not to expose these elements – from structural steel to bare concrete and shadeless lightbulbs – which might ordinarily be hidden. Should you dare to bare? Be inspired by these ideas for creating your own unfinished masterpiece. Exposed structural timber is a much more common sight than some of the other materials in this story. And it doesn’t just feature in Tudor cottages or barn conversions, either, but in thoroughly contemporary properties, too. 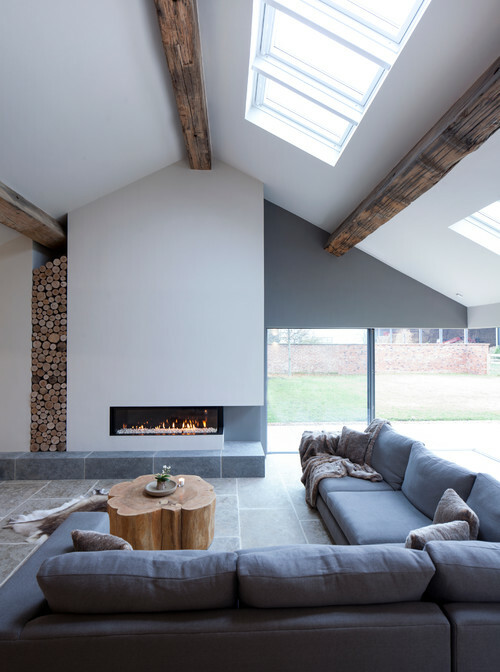 Raw timber on show in a home creates a sense of bringing natural elements inside, and there’s a real life essence to be gained from this look. Structural oak beams in particular bring so much feeling to a space. And in terms of design, dark woods are wonderful for a framing effect against crisp white walls and ceilings – great for demarcating areas of an open-plan space. Cherry and lighter woods work well as part of an overall scheme; bring them in through wooden furniture, floors and staircases. Wiring can be used in interesting ways. 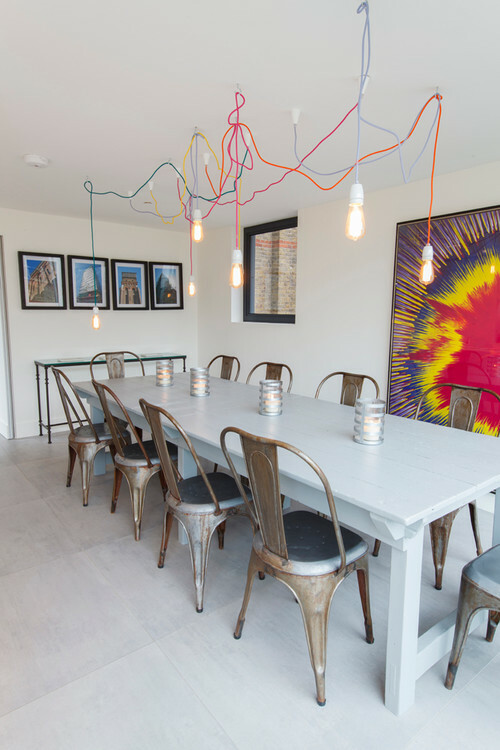 The most common is to hang lighting cables in an arrangement that suggests a sense of temporariness, as in an art studio or a construction site where festoon lights have been hung for a specific purpose. The opportunities for incorporating wiring in this way are really only in relation to lighting schemes, but with a little design flair the possibilities are endless. Cable sleeves can be created from a massive range of materials and in any colour. Again, designs should be checked, installed and certified by a qualified electrician. Bricks and mortar are rough and cold – not a look that immediately comes to mind when you’re designing a cosy living room. Yet using exposed brickwork, especially on one feature wall, has great design merit. 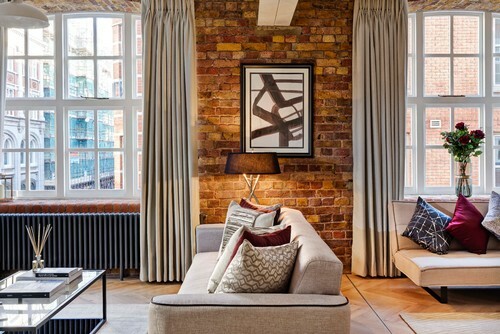 The subtle irregularities in texture and colour can really be brought to life with some skilfully placed lighting, such as the low table lamp that casts a warm glow in this warehouse-style flat. 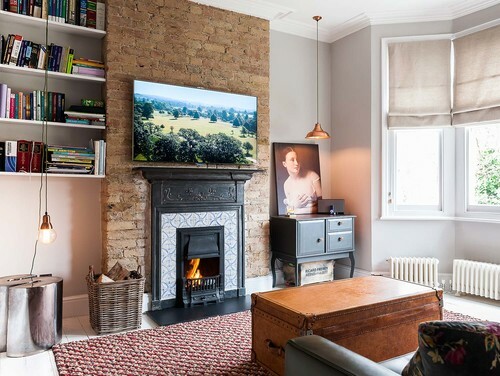 If you’re lucky enough to have a good-looking internal brick wall in your home – like this chimney breast – then simply treat it and seal it with clear or coloured products that can be found at any builders’ merchants. If not, then brick-effect panels can be fitted, the benefit of which is that you can identify a pattern and colour that works for you. Pipework is a wonderfully versatile material with which to get creative. In fact, when I was training as a heating engineer, we would create small sculptures from 15mm and 22mm copper pipe to demonstrate skill in pipework. The most common raw finishes are steel and copper, although any finish can be achieved through painting, plating or polishing. There’s a huge variety of fittings and fixings, as well as threading and bending techniques. Uses include water and gas, obviously, but pipe can also be used as cable trunking to form some interesting lighting features. Any design that makes functional use of the pipework however (as opposed to strictly decorative) should be approved as safe and installed by a qualified and competent engineer who can certify that the work complies with the relevant regulations. Probably the most overlooked building material as a raw, unfinished design choice is concrete. 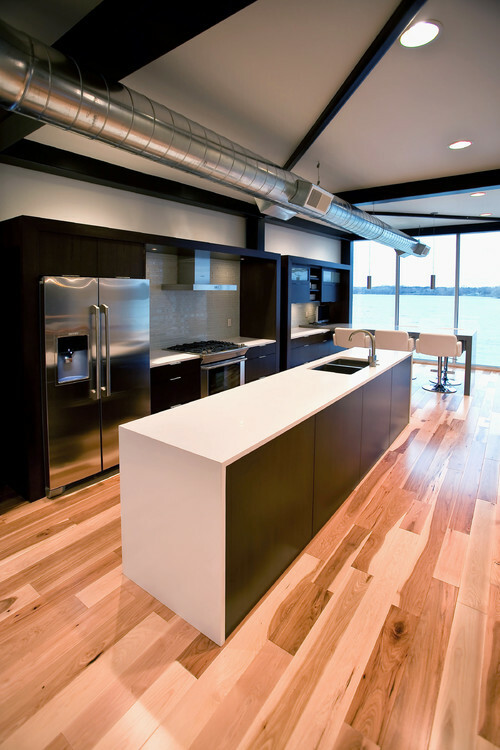 From prefabricated panels to polished concrete kitchen worktops, raw concrete is such a versatile medium. Concrete also lends itself beautifully to a minimalist interior. There’s a nakedness to it that asks for solitary items of furniture or artwork in isolation. The irregularities in surface colouring work with other materials that are natural or imperfect in some way – antiqued glass (acid distressed) is a wonderful example. The practical purpose of ducting is to achieve proper air flow. This is something massively overlooked in the UK; because of our cool climate, we’d rather seal everything up. A good ducting system will, however, keep the air throughout the home fresh and clean and make central parts of the property feel noticeably more comfortable. OK, it’s a bold look to have ducting out in all its glory, but design fortune favours the brave. Raw metal ducting on display can look severe, but it can also be striking in contrast to a minimal, contemporary room. 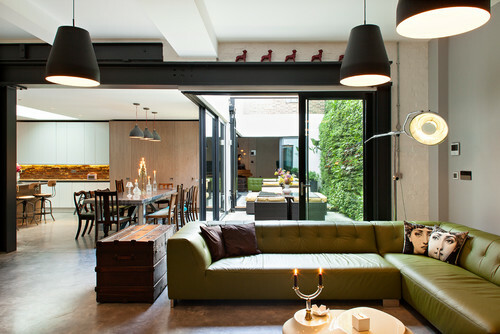 Equally, it can look right at home in a space that incorporates a lot of other exposed raw building materials. Be conscious of noise implications when situating the outlet, and make sure you get up there frequently with a duster – keeping the ducting shiny will mean the difference between a really cool design feature and an unfortunate consequence of a poorly designed building. Steel is a remarkable material for what it allows us to achieve in architectural design, to the point that we can appear to defy the laws of physics with floating staircases, split-level mezzanines and the like. 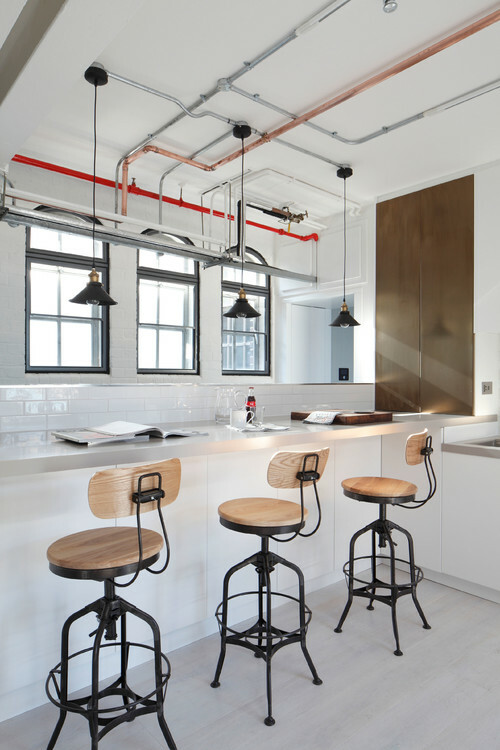 Structural steel can be left exposed to give a great industrial twist to an interior. As with exposed ducting, this is a strong look and will work best if you really make feature of it. Standard profiles include box sections, RSJs (UCs and UBs in the trade) and PFCs. Big chunky connection details with spot-welded plates and M20 (20mm diameter) bolts are always impressive to see. Again, check your regulations: steel that’s integral to the structure of the building itself must be enclosed by fire-rated materials and so cannot be left exposed.